Free Printable American Football Word Search. Free Printable Word Search of American Football, great activity for all the American Football and sports fans. Free American Football word search puzzle that you can print and give to students, co-workers, children, family. Print it using your inkjet or laser printer and have fun searching all 24 football related words. Find words of American Football like, fumble, super bowl, penalty, fans, cheerleaders, touchdown, tackle, interception, first down, kickoff, field goal, sack, extra point and many more. The word search includes the football word list and answers included on page 2. 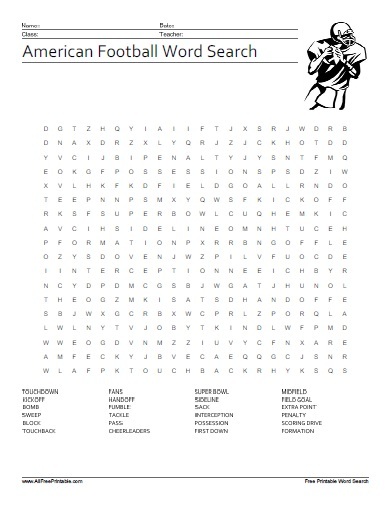 Click the link to download or print the American Football Word Search now in PDF format.